The MintBox maker is expanding its lineup with two interesting options. On the entry-level front, fitlet-T is an AMD barebone, powered by a pretty unconventional yet powerful Puma GX-424CC (4 cores @ 2.4GHz, 25W TDP). The fitlet-T is faster than last gen i3-4010U Intense PC, and priced 30% lower. It's available right now for $386. On the performance front, Intense PC goes Broadwell with IPC2-i5B and IPC2-i7B. The feature-packed SKUs are powered by Intel's i5-5200U (2 cores / 4 threads up to 2.7GHz, 15W TDP) and i7-5600U (2 cores / 4 threads up to 3.2GHz, 15W TDP). 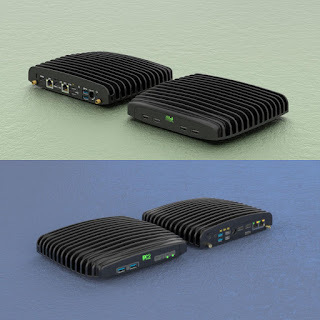 As far as we know, the Broadwell IPC2 is the only fanless mini PC to be able to pack 32GB RAM on top of 3 storage bays (one 2.5", two mSATA), triple display mode, two Intel Gbit Ethernet ports, and on-board uSIM socket. It will be available early 2016 from $638.